With 19 function rooms of varying sizes and flexible formats, Richmond – the stylish convention hotel – is ideal for all kinds of conventions, meetings, banquets, weddings and cocktail parties. 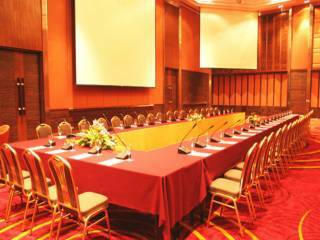 the elegant richmond grand ballroom can seat up to 1,200 people theatre-style. All meeting rooms are equipped with the most up-to-date hi-tech features, with professional-standard audio-visual equipment, video conferencing facilities, wifi internet, digital signage, plus an experienced team of meetings experts to ensure the event is successful and well-run.